After a few quiet days at beautiful Chacala we went around the corner to another favorite location in Banderas Bay. Our first week back has been spectacular. 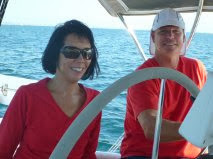 In the anchorage off Punta de Mita, about 18 miles north of the downtown Puerto Vallarta, we enjoyed reconnecting with two sailboat friends, Debra & Danny from Cyclades, and Marie & Leonard from Mi Casa. The water is still warm, about 78 degrees F, and usually flat with a light breeze in the morning. 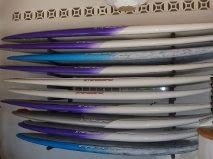 Perfect for the morning "ladies paddle" (SUP), and later, surfing the breaks off of Punta Mita. Nancy set up her keyboard and is diligently practicing 2 solos, Debussy and Chopin, as well as some chamber works for her return to La Paz. With the gentle rocking of the sailboat while playing, she found herself actually falling asleep while playing. Rob used extra time to catch up on small boat projects as well as some Arduino electronics geekiness. He kept tweaking the systems so that Shindig could keep up with being off the grid. This is the longest we've been unhooked from a Marina, and it has been a nice rest for both of us. With Cyclades' car, we had several trips into the big city, loading up at Costco, Home Depot, Zaragoza, and a nice Italian grocery/wine store in the Marina Vallarta. 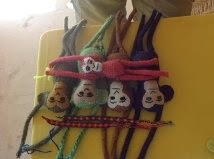 Nancy joined Marie on her morning bus commute and hit the town of Bucerias, getting her hair done, shopping and visiting local jewelry and art boutiques. We are sorry that Mi Casa is leaving to head to San Diego for further adventures. We enjoyed one final good-bye dinner with a group of cruisers at the street tacos restaurant and later, a beach side restaurant aptly named Margaritas before they left. More sailboats are arriving as this is the season to be exploring the Mainland. 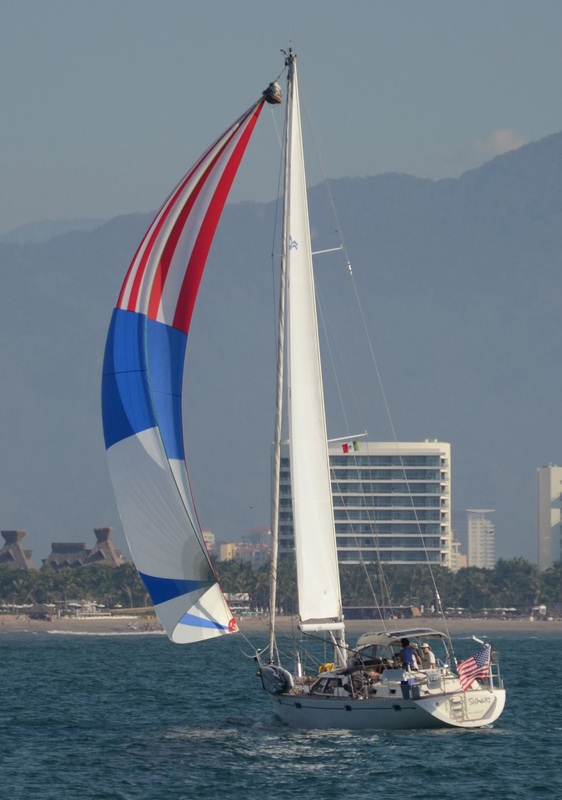 Today starts a 3 day community/sailing event, the Banderas Bay Blast. Shindig is ready to play and sail hard. Besides having the friendly Mexican community and lots of fellow cruisers in town, La Paz might be the best place in Mexico to get boat projects done. Before we left the States in 2012, there was a very long list of things to do for Shindig to be "ready". The high priority items got done and lower priority or 'nice to have' items were delayed. Now we know that LaPaz is a great place to tick off that long list of boat projects. Here are some of the projects that we worked on to get Shindig ready for the season. Shindig is lifted for the short trip to the water. Fresh paint, fixed thru-hull and new zincs. Damage control pump impeller has been replaced. In case of a flooding emergency this engine driven pump can move a lot of water! For years the vent loop on the generator has dripped water into the engine room. The salt water corrodes everything it touches and the problem has gotten worse as we use the generator more.... makes sense. My fix was to have Ernesto the metal fabricator make the fitting above. It fits in the cockpit drain hose and vents to the top of the generator raw water loop. New fitting installed on the left. Vent loop on the right. 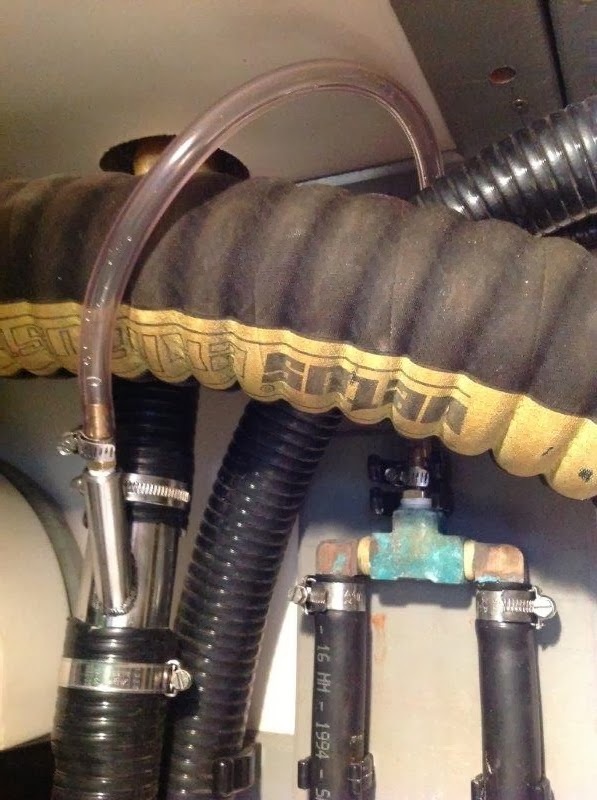 Now when the generator runs it dumps water in the cockpit drain and when the generator is off it vents the loop and does not allow water to get into the exhaust side of the generator. As a side benefit when the generator is running you can hear water gurgling down the drain. Not only is it soothing... but a good indicator that you have good cooling water flow to the generator. Ernesto also made me a flopper stopper. I gave him the dimensions and design details and a few weeks later it was done. This device is also sometimes called a roll stabilizer. It rides in the water, dangling from the boom or the spinnaker pole. As the boat rolls to one side it folds deeper into the water and as the boat rolls the other way it wings open. 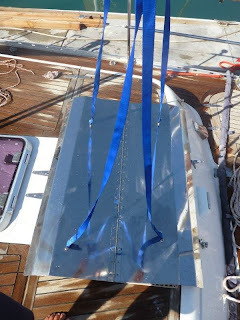 In the open position it provides a lot resistance in the water and slows the roll of the boat. Last season I borrowed one from our buddy Danny on Cycledes when we were in Punta de Mita. 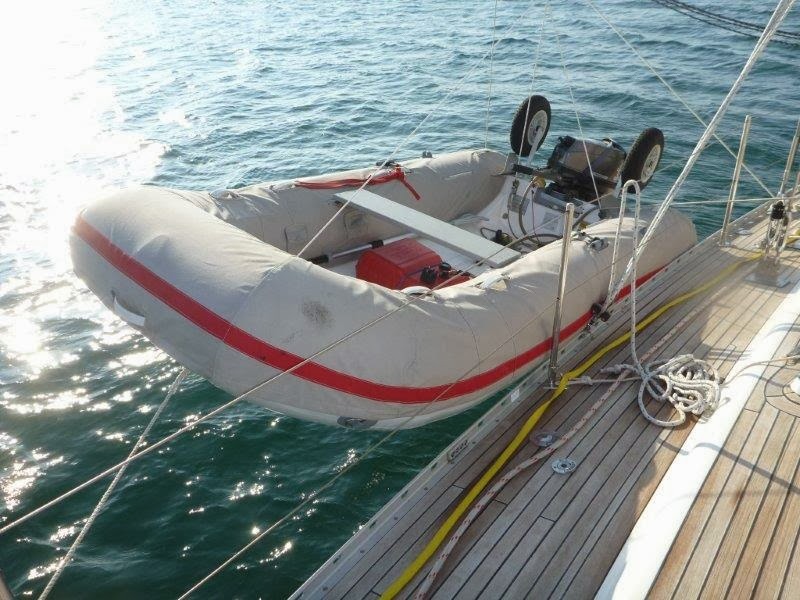 It really made the motion of the boat more comfortable in a rolly anchorage. Jeanne from Eagle/La Paz Cruiser Supply made the webbing bits for the bridle. We are in Punta de Mita now and have had it deployed for a several days. It works great! 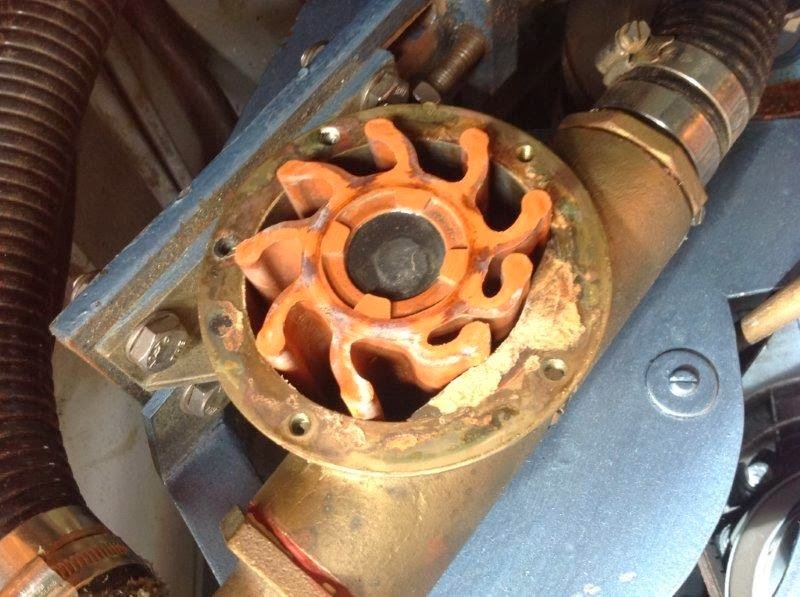 Discovered this busted hose clamp on the generator heat exchanger. Salt water from the dripping vacuum brake slowly ate it away. Hector in LaPaz used the sunbrella fabric that I brought down to make a nice dinghy cover or "chaps" for our daily driver. The red stripe was my idea to make is distinguishable from others at a distance. It is also Nancy's favorite color. Full boat cover helped keep the intense summer sun off Shindig's decks. We have arrived on the mainland! The passage from Baja to the Pacific side of Mexico was good. We surprised ourselves and friends by deciding to leave last Sunday, a couple days after Thanksgiving. The weather window looked too good to pass up, as there was a healthy Northerly coming down the Sea of Cortez. We sailed fast to Muertos in about 8 hours, with winds about 15-20. Then we needed to plan our remaining 254 nautical miles. After a large dinner, we decided it was best to leave that same night at Midnight, to leverage the good wind, and minimize two full overnighters. So up we were at 1130PM, sailed all night and day for the next 24 hours, and then motored the rest of the way to Isla Isabel, the first land stop. After resting, we had a full day with hiking, paddle boarding, snorkeling and swimming before getting ready for our next shorter leg to the mainland. 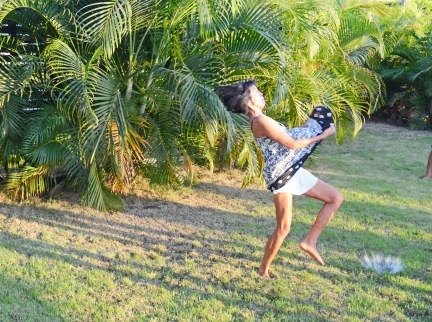 We left at 545AM and arrived at Chacala, a quintessential palm tree little anchorage north of Banderas Bay. We are here! Side note. Isla Isabel can be a challenging anchorage because of the rock bottom can eat your anchor. Here are the secret GPS coordinates for a patch of sand in 30 feet of water. 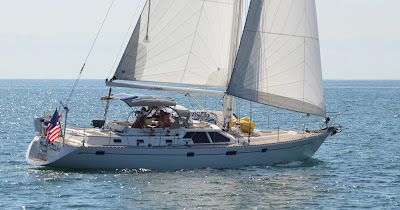 With a healthy breeze on the beem, Shindig hit 9.3 knots going from La Paz to Bahia Muertos. The trip was 8 hours, no problemo. Rob sailing down the Cerralvo Channel towards Muertos. Day break, and it's time for a nap! Can't wait to have lunch there tomorrow!